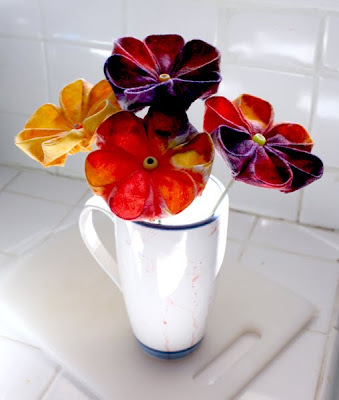 Filth Wizardry: Kitchen paper and baby wipe Kanzashi flowers. I had never heard of kanzashi tsumami until recently, when I saw the book "Kanzashi in bloom" by Dianne Gilleland. I don't have a copy myself, but I was curious enough to look up the very old art form on the intertoobs and found several tutorials showing me how to get started. I'd still like to get a copy of Dianne's book though, because she seems to have a lot of ideas in it that would make great gifts. 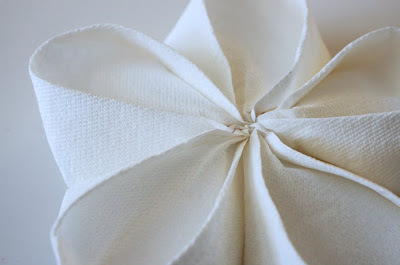 Here is a simple set of diagrams showing the basic petal folds. 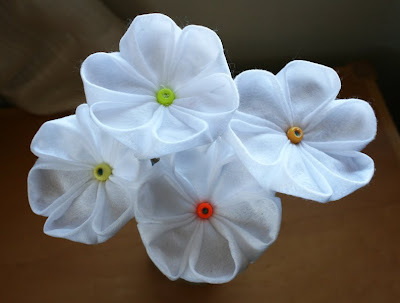 I just used the rounded petals for the flowers that I made for the kidletts. 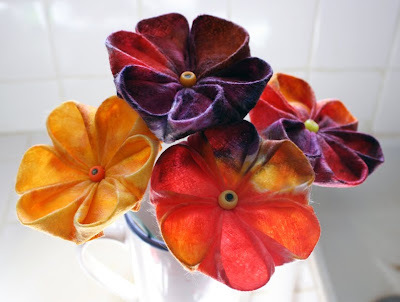 I've made a few fabric versions of these flowers using the different petal types with nice neat hand sewing, and rather enjoyed the process. 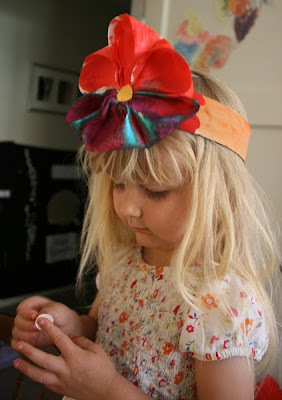 The kidletts thought the flowers were very cool and wanted to make some too, but well, they are three and four years old and as simple as this craft is to pick up, it probably wouldn't be at all doable for them until they are at least around six or seven, because it's quite fiddly. 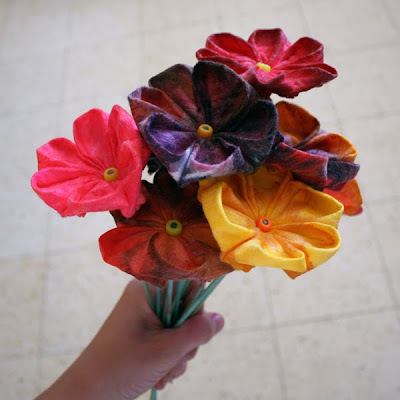 I came up with the idea of making some giant kanzashi flowers from kitchen roll for them to paint. 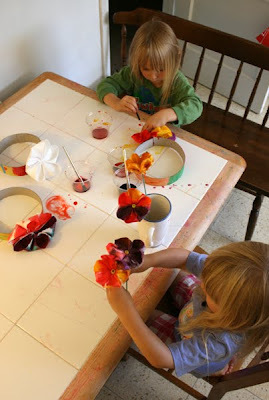 The kitchen roll is the sort that doesn't disintegrate when it gets wet, so they can paint the finished flowers without them falling apart or ripping. 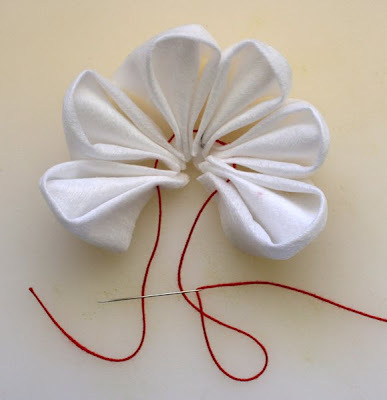 Once the flower petals had been drawn together on the string and tied off, I turned them over and folded over where the petals joined and stapled them down together to tidy them up and make them more sturdy. 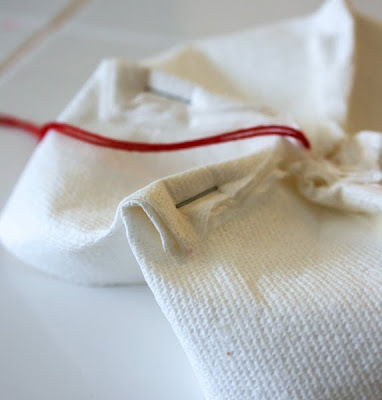 so, kitchen paper cut into squares (four squares from each sheet), a bit of string and five staples. 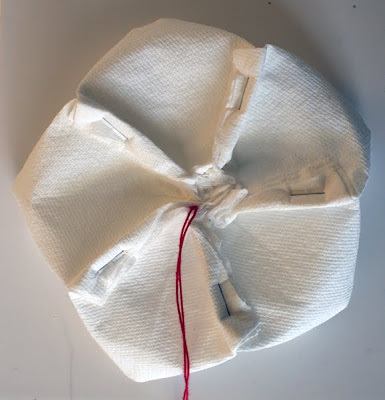 I made another flower with six petals too. After the flowers were made, I cut a bit of dry wall shim from our stash (yup, we still have loads left even after making roads for the train table, dresses, and roman army costumes out of them). The kids decorated the shims before I cut them to the right head size and stapled on the flower. Then they could paint them with pots of watered down food colouring and hang them up to dry. There was some crazy chromatography going on with the purple food colouring. It separated into purple and blue whilst soaking into the kitchen towel, which was pretty cool. 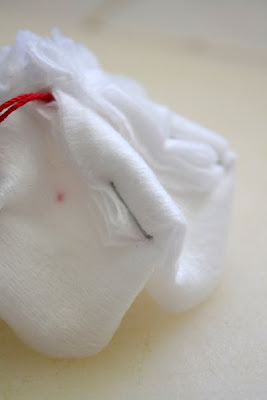 After I'd made the kitchen towel flowers I thought I might try some out of dried baby wipes, because they have that fabric like soft texture. I stuck a handful of baby wipes out to dry and then cut them to be square. This time I wanted to make smaller flowers for the kids to make a bouquet for grandma, so I cut each square into four smaller squares, then made the flowers in exactly the same way that I had done with the kitchen towel. They came out about palm sized. I'd died a packet of wooden BBQ skewers green ages and ages ago with food colouring, originally because I thought I might use them in the cardboard flowers craft we did, but in the end the pipe cleaners worked better for that, so we still had the green skewers handy. I used a couple of plastic beads to sandwich each flower onto the end of a skewer with some hot glue. 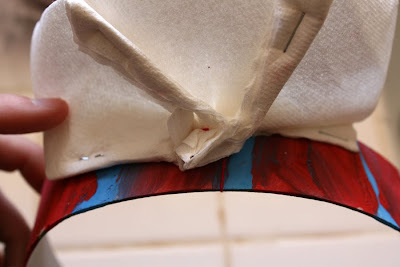 Quick and painless way to make a stem for them. Again the kids painted them up with watered down food colouring. They really got into this, to the point where after they had painted the first four, I ended up making them six more, so grandma will have a bunch of ten daisies. Maybe we should give each grandma five daisies though. Cool thing is that both grandmas are 5000 miles away and these are going to be nice and light to mail to them! They are pretty well formed, even after being soaked and smashed by the kids painting them. I could give them a quick squirt with liquid starch I suppose if I was being picky, but really I think they are fine as is. They might make a cute and inexpensive gift for a teacher too, and I'm sure they would look a lot classier if you used some nicer beads for the centers. While we're on the subject of kitchen towel... They make totally mean magic carpets too! Our house is one where you are free to express yourself. Consequently Aladin feels comfortable in his desire to cross dress. Poor guy, it's so difficult to find a smoking hot dress that looks good with a fez. Such creative materials for kanzashi! Diane will LOVE this - I'll be sure to let her know. Still loving your blog! Some blogs just strike a chord with me, and yours is one of them! You're so awesome. I love all your ideas. thanks for the idea- we are going to do this this afternoon! wow baby wipes? And kid-painted? Thats two times the awesomeness! They turned out so great! And ya, don't worry about being to careful with your folds - it has yet to make a difference with mine. I have a few tutorials on my blog. ACK! Aladdin in a dress! You got me there...had to laugh out loud at that one! Love your blog, btw. Aladin -- THAT made me laugh. Really laugh. Thanks! Such a fun idea. The flowers came out really beautifully. 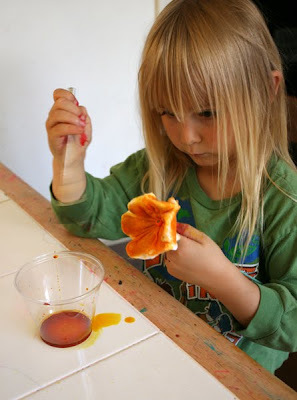 And using food coloring gave such vibrant results. 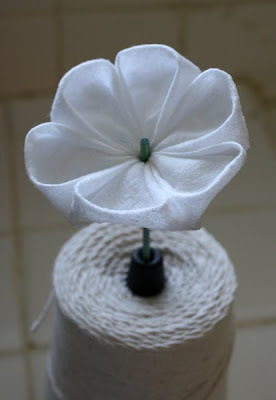 I love making flowers and will definitely be adding this kind to the tissue paper and pom-pom ones we have in a planter and our house. Thanks for the fun idea! We made these today and both kids went nuts for it! Unfortunately we were out of red dye so the flowers were limited to blue, yellow and green. But they were so focused and proud of their products. I ended up assembling 6 of them during the craft time I had planned to do that afternoon and then when my younger son was napping my daughter helped me fold up petals to sew/staple and I made 6 more just for her to paint. Flowers flowers everywhere!! Thanks for the lovely words folks! It's really cool to come back to a post and hear that several people are going to try the craft, or already have! Princess Jasmine and Queen Aladin have been making me giggle for days now. My three year old thinks anyone can improve their appearance with a nice big pink dress though. Thank you for the award Basia! I will thank you properly in a post soon. BTW, I think Aladdin looks great, I think he's a summer. I LOVE Aladdin's pretty pink dress - he looks fabulous. What a funny post, it made my day! Your flowers are really beautiful! What a great idea. I am totally going to try this with my children! Gorgeous! I now know what we are using for our holiday packages! Excellent idea, I can't wait to try this with my daughter. I am also planning on making some of the baby tissue ones in pink and green to decorate her room. I love how you've reworked the original idea to work for you. Oh - and you were mentioned in today's Crafty Crow, so I'm sure you'll have lots of new visitors. Congrats! Stunning! I can't wait to try this with my daughters. This is the coolest project! 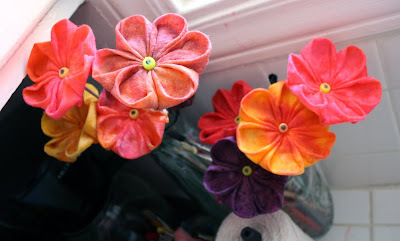 I love your Kanzashi-making method, and the colors are so beautiful. I'm totally making some of these. 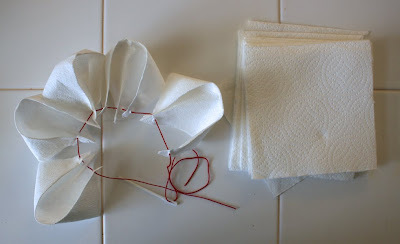 You've also inspired me to try some plain muslin Kanzashi with dampened and lightly dye-dipped petal tips. Hello there Sister DG! So cool that you found us here! I'd never have heard of kanzashi if it wasn't for you! 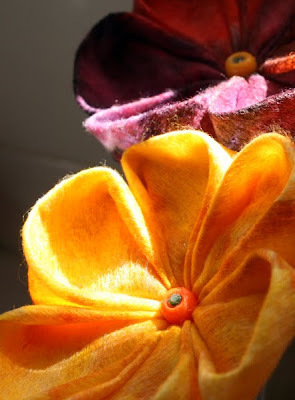 I'd be more than happy for you to use our kanzashi pics in your flickr album. I'm going to pop over there and check out all the ones other people have made. It's such a beautiful, flexible and adaptable art form. Love it! What a wonderful idea, that you for sharing it! You are a crafting genius. love this site. 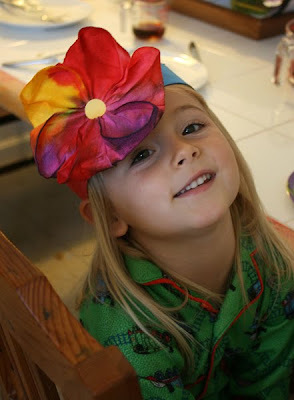 Wonderful job - looks easy enough for ME to make, and I know my little one would rock out painting them. I linked to these on my weekly roundup (post is here) - thanks so much!! Thank you so much for your inspiration. Here I was just making them out of plain fabric. 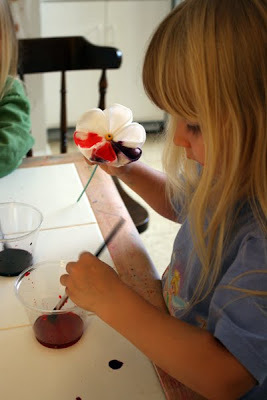 So much more fun to get the kids involved and do an activity!! We made a few, unfortunately my paper towel is the soggy kind. 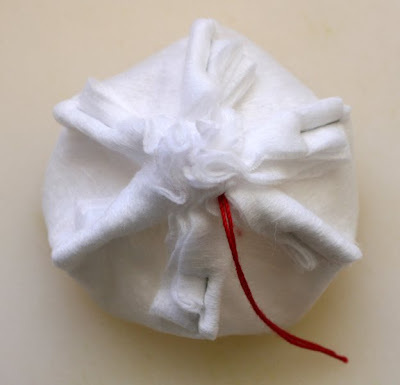 We did the baby wipes and I was inspired to do a frangipanni. Its funny how sometimes you need someone to tell you to do things a different way. The world needs people like you !! I loved your Kanzashi flower tutorial so much, my daughter and I made a bouquet for my mom for her birthday. The colors didn't turn out quite as vivid as yours, but we loved how our bouquet turned out. I wrote a short piece for my blog and credited the idea back to your site. Here's the link, if you'd like to take a look! 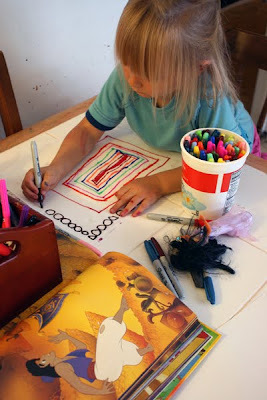 Found your tutorial via Pinterest and love how you support your girls in doing crafts-- you are giving them a gift which will be so useful to them in their later lives! 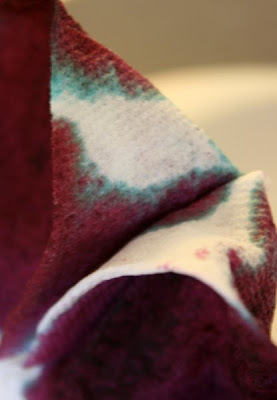 The colored baby wipes are so much more interesting than tacky cotton fabrics I think -- much more organic and colorful. I work in polymer clay and can see making some complex centers for these-- maybe something for some faux pointsettias for Christmas. Thanks!